Books ready to be shipped! 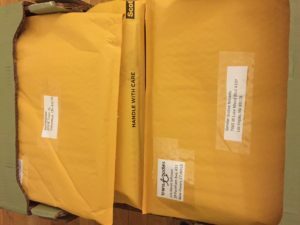 As part of its mission and vision, the Trans Bodies, Trans Selves board has donated over 190 copies of Trans Bodies, Trans Selves to organizations that serve trans, gender expansive, and non-binary people, all others who fall under the transgender umbrella, their loved ones, and their providers. In addition to donating books to LGBTQ community centers, health clinics, schools, and other trans networks in every U.S. state, we have also partnered with LGBT Books to Prisoners to send 100 copies of TBTS to currently incarcerated LGBT-identified individuals. We donate up to 100 books every year in donation cycles that occur in April and October. Priority is given to organizations with small budgets and those located outside of urban areas. If you know of an organization that could benefit from a free copy of TBTS, please fill out this form. We will consider your suggestion as part of our next book donation cycle. A map of our book donations from October 2016. 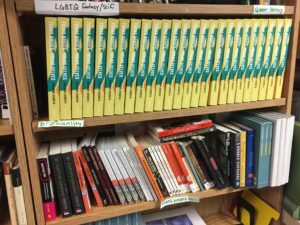 Books happily on the shelves at LGBT Books to Prisoners!